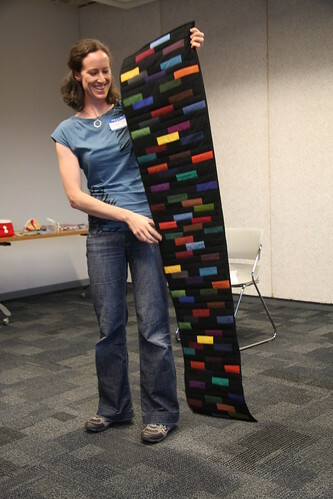 We completed this Challenge in 2011, but it’s never too late to review all the amazing quilts made with the Charm Square packs of Kona Solids in the “darks” colour palette that Robert Kaufman generously donated to us. Here are the finished projects in no particular order. There are many, many more in the VMQG Flickr pool (go back to at least page 11!). Thanks, everyone, who participated in the challenge – it was incredible to see the myriad beautiful ways our members approached the project! And last but not least, thank you Robert Kaufman for the opportunity to be inspired! If you’ve been working on your challenge using Robert Kaufman’s Kona Modern Quilts fabric line designed by the lovely Cynthia of the FVMQG but you need more fabric, here’s a chance to get it at a great price. Marmalade Fabrics is holding a summer sale where Cynthia’s fabrics are 15% off! They have several other great lines on sale too, and they are a company I’ve always been pleased with ordering from. 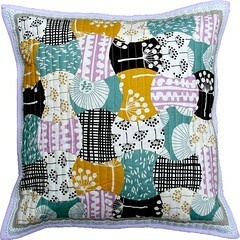 The sale is also great if you didn’t get the fabric at our August meeting but want to work with the prints. Bring your finished objects to our Monday, November 19th meeting to show off. We can’t wait to see what you’ve been working on! Using your sheet of paper as a foundation, alternate the ties and white cotton to create stripes that run lengthwise on the paper (11 inches long). Leave your edges a little larger than the paper to allow space for trimming. Your tie stripes can either be made from one tie, or several pieced together. Please leave the sheet of paper attached. Tip from Amy: use lots of pins, and UHU glue to tack it in place. 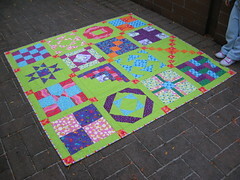 All the finished blocks will be assembled into a group quilt. This quilt will eventually be a fundraiser with a portion going to the guild and a portion going to a charity that will be chosen over the next few months. My piecing style was quite liberated– I alternated wonky strips of white with whole and pieced tie sections, then trimmed them down…. It was really easy! 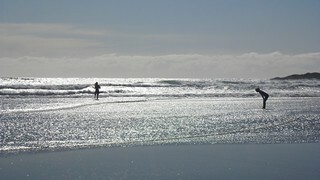 Photos in this post by Sonja Callaghan. 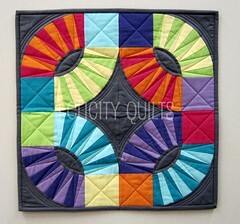 We are very excited to do a second swap with another modern quilt guild. This time we are going international, but staying west coast, and swapping with the Portland Modern Quilt Guild! Please read over the guidelines carefully before committing. Then fill out this form by Friday, April 27th to register. You will be assigned your partners in early May. 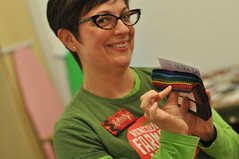 Kalin will coordinate the Vancouver end of the swap so please contact her at kalin@vancouvermodernquiltguild.ca if you have any questions. 1. It will be mixed partners, not a 1-to-1 swap. 2. The project is one pouch with some sort of closure (velcro, zipper, snap, etc). 3. Finished size should be somewhere between 4×4 and 8×8 inches. 4. To participate, fill in the online form by Friday, April 27th. If you want, you can create an inspiration mosaic (using Big Huge Labs’ Mosaic Maker tool) and post it to the Vancouver Modern Quilt Guild’s flickr group. This is an optional step. It helps your partner get to know your style. 5. Bring your finished project to the May 17th or June 21st meeting. If you can’t, let Kalin know. 6. Projects will be shipped as a group so please label your pouch with your name and the name of the recipient. And just in case here is the link to the Registration form again. 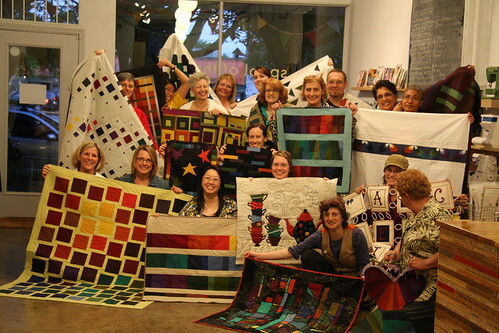 With all the Quilt Shows and events in our area we decided to make a Google Calendar that everyone can access to see these Quilt related events, along with the guild meetings and sew-ins (& workshops!) we organize. Please visit our Calendar page to view the current month, or if you’re a regular Google Calendar user, add it to your profile. If you view the event details we will include locations, agendas and other details depending on what kind of event it is. If the event is longer than 1 week, we have only marked the first and last date of the event. 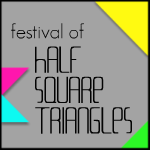 Know about an event that you think should be included? Send Kalin or Holly an email. Your executive spends a lot of time looking into times and locations for our sew-ins. We want to make sure they allow as many of those who are interested to attend. While members get priority on attendance, we welcome non-members and it is a great way to see what we’re all about as well as work on your projects. The guild does subsidize these events, but they would be most sustainable if we have enough attendees to cover the rental costs of the space. We’ve put together a poll to get a sense of the most popular days and times for sew-ins. Please choose as many options as apply to you (e.g. if you can come on both Saturdays AND Sundays, just click both) and if you’d like to give us more information, please comment on this post. We will be discussing the results at our next exec meeting in the first week of April. Also, we are going to be adding a monthly poll to the side bar of our website. 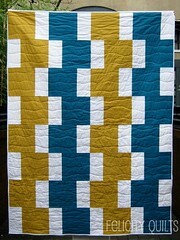 It will be quilting related, but not necessarily guild related. So if you’re not a member, or not even a regular guest or potential member, we’d love your opinions to be included! Here’s our latest Member Spotlight. I am enjoying seeing how each of you approach your answers. Enjoy learning about Sky this month. 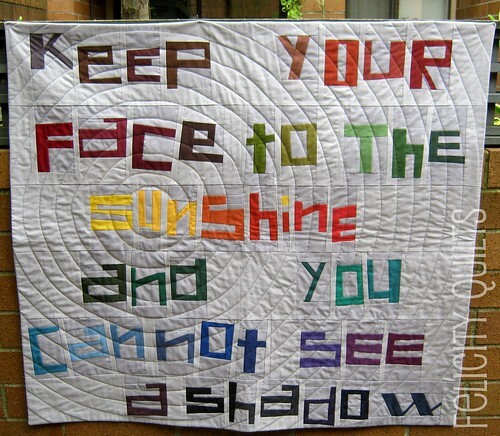 I have always loved fabrics and sewing, so when my aunt introduced quilting to me, I was hooked. 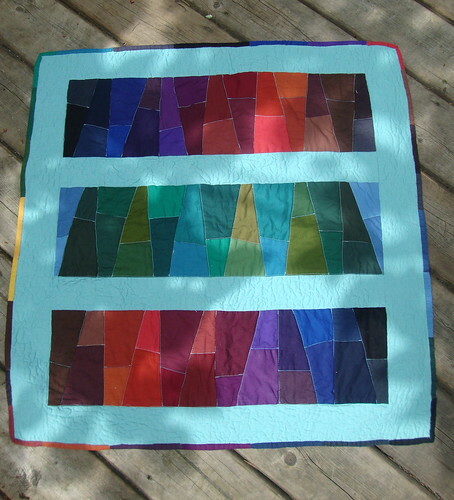 Sewing various colours and shapes together to create a functional, beautiful quilt was and still is a delightful, rewarding endeavour. 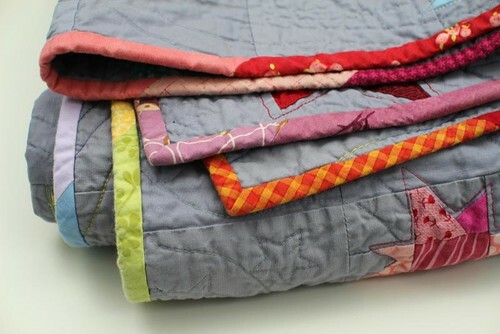 The UQE’s (ugliest quilts ever) can be recut, refashioned and reworked into something beautiful, nothing is ever a loss when thinking outside of the box. It’s so much fun to explore the possibilities. Modern quilting to me can be the combination of bold and bright prints and plains with some traditional blocks used in an untraditional way, all the way to freeform shapes randomly sewn together in a pleasing combination. It’s an art form limited only by my imagination (or stash). When what I make is to be given away, a traditional pattern in thoroughly modern colours on one side would have a non-traditional fun design on the other. Satisfies my inner rebel. What is your favorite moment as a guild member so far? I love being a member of our Guild. It’s hard to pinpoint one favourite moment, rather it’s a collage of highlights: warm greetings, show and tell, coffee times, retreat days, inspiration, encouraging remarks…….great times. 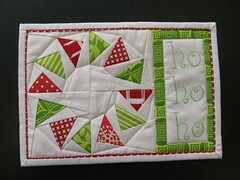 All of my piecing and quilting happens on my Bernina 630, my backup machine is a Bernina as well. 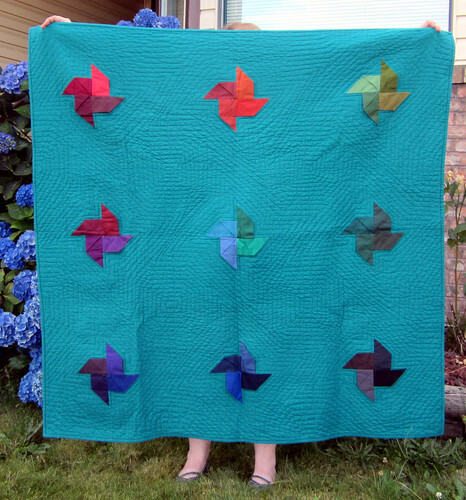 I have never sent a quilt ‘out’ to be quilted, preferring a free-motion design of my own. Part of personal growth in any design process is learning new techniques and incorporating them into projects. 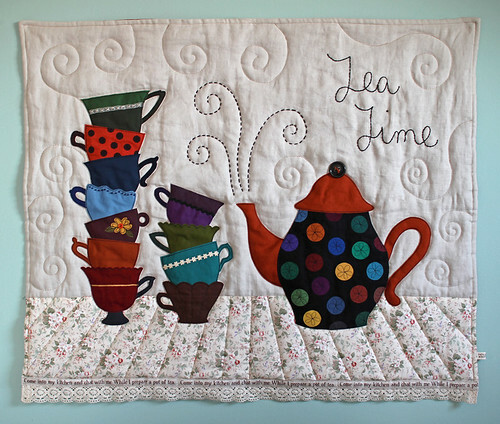 Ansa Breytenbach, a New Zealander, has caught my imagination with her combination of appliquéd curves, quilt ribbons, pieced squares and vibrant colours. Her pieces are fascinating and challenging. Definitely some skills there that I would like to learn. Pretend it’s a cold winter day and you’re spending it snuggled up on the couch with your favorite quilt…What are you eating and/or drinking? On a cold day like today, you may find me in front of my fireplace, drinking my new favourite tea, Mint Yerba Matte, and ……knitting……or reading……..or writing…….or dreaming and planning my next project. Lovely answers Sky! If you want to learn more about Sky you’re going to have to ask her at one of our meetings.